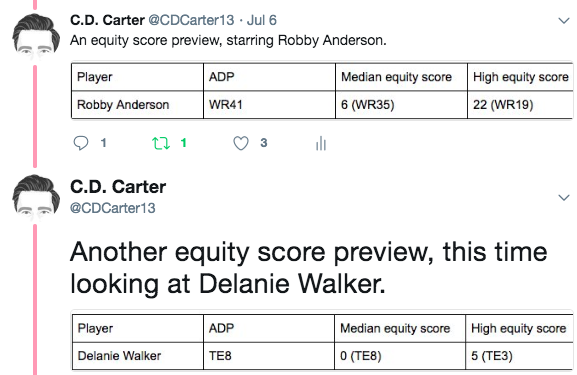 UPDATED 2018 Fantasy Equity Score Report: Exploiting ADPs By Exploring A Range of Outcomes — Draft Day Consultants, Inc.
C.D. Carter started making fantasy equity scores in 2014 using Rotoviz sim scores as a baseline for creating median and high projections for fantasy-relevant players. The app is designed to see what similar players did after they had a season that was comparable to the subject player. It draws from similar players’ production and offers a range of outcomes based on those numbers. Carter then adjusts projections based on conservative (median) and best-case (high) scenarios. This involves total touches, touchdown rate, yards per throw or catch, and a range of other measurements subject to regression. The equity piece of the equation is the gap between where a guy is being drafted and where his median and high equity scores might land him at the end of the season. A player with a negative high score is a flaming red flag, while a guy with a positive median score should pique our collective interest. This process reveals the reliable yet boring types — guys with median and high prospects sitting near each other — and boom-bust players who have median and high scores miles apart. This year’s equity scores include 26 quarterbacks, 53 receivers, 36 running backs, and 27 tight ends. Carter has equity score write ups — further breaking down a range of outcomes — for more than 50 players. Draft Day Consultants, Inc., brings some of fantasy football's brightest minds into your draft room, helping you dominate league mates with top-notch advice on the fly. For a reasonable hourly fee, we'll help you build a fantasy football roster primed for a championship run.